Ohio has four seasons: 1. Almost winter, 2. Winter, 3. Still winter, 4. Road construction. Yeah. It’s been one of those winters. You know, the winters where you can’t bear to do much more than snuggle up in five blankets beside a fire trying to keep your toes warm. Because the cold weather makes us extra hungry. 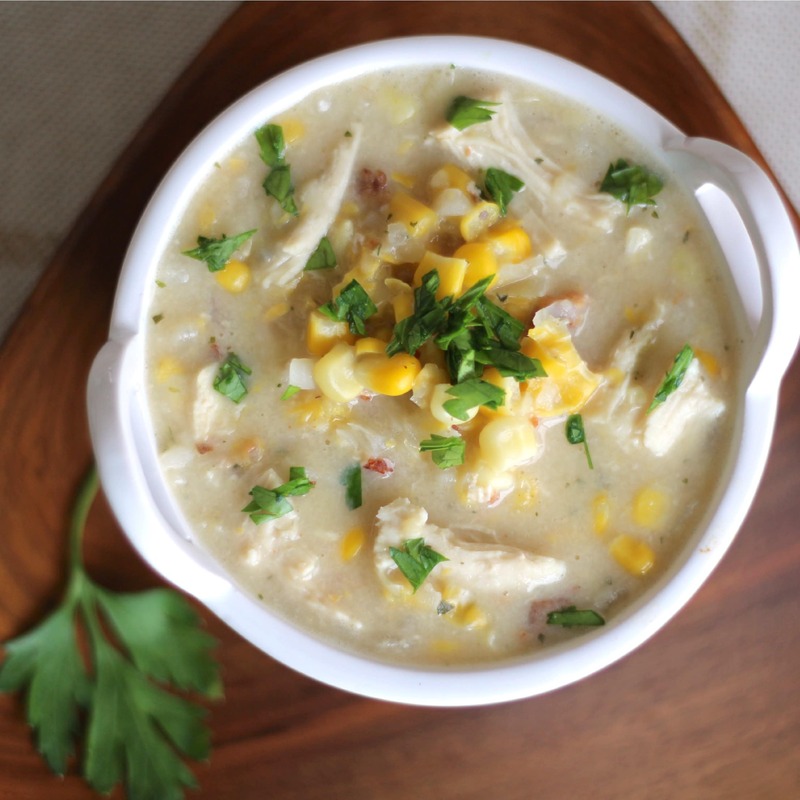 This chicken corn chowder combines the sweet, sunshiny flavors of corn (oh, summer … we remember how good you taste! ), with just a hint of smoky bacon. All in a steamy, warm, rich, creamy, keep-you-toasty-because-it’s-negative-forty-degrees-outside chowder. The most comforting part? You just toss everything in the slow cooker and walk away. Soooo easy! And this makes a BIG batch – it’ll still be fabulously delicious right on into another dinner later in the week, or as several warm, cozy lunches … or you can freeze the leftovers! After the incredible response to our 3-Ingredient Crock-Pot Chicken Tacos and Crock-Pot Crazy Pineapple Chili, we knew you weren’t kidding about wanting quick, easy (yet healthy!) slow cooker meals. Well, THK friends, we’ve got you covered, with lots more healthy crockpot chicken recipes to make dinnertime easier – like this amazing, hearty, family-favorite chowder! Now, we know you may be kinda surprised about a few things. Hmmmmm … bacon … in a THK recipe? And frozen onions … and cream of mushroom soup? Are you sure?!?!? Bacon: Of course, you could cook up your own turkey bacon, lower-fat center cut bacon – or even veggie bacon – and crumble it in. But occasionally we actually embrace the time-saving step of using pre-packaged real crumbled bacon (not Bac-Os). A little goes a long, long way to adding meaty, smoky depth of flavor to health-ified recipes. Oh – and check out the nutrition label. Go ahead. We’ll wait. We bet you’re looking at only about 25 calories and 1.5g total fat per tablespoon (we call for four tablespoons – 1/4 cup – in this recipe). Spread that out over all those servings, and you’re getting a lot of flavor without too much nutritional compromise. Frozen onions: These beauties are a busy cook’s dream, at least in certain long-cooking recipes. They’re perfect in this corn chowder because they cook down enough to really soften and meld into the soup. If you can’t find frozen onions or just happen to have a fresh onion you need to use – that’s ok, too. We’ve used fresh onions in this recipe many times. But given the choice, for this chowder, we definitely prefer the softer, silkier texture of frozen. From a nutritional standpoint, frozen veggies are generally considered to be similar to fresh, and are sometimes even nutritionally superior because they’re allowed to fully ripen before being flash-frozen at their peak. Bonus of using frozen onions? It saves time … and tears! Cream of mushroom soup: We know sometimes it gets a bad rap for being too old-fashioned (you know … think 1950s cream-of-anything mystery casseroles!) but we did significant testing of brands and proportions. We found that there are some great new choices on the market that offer a wonderful, creamy and flavorful backdrop for modern, healthy recipes. Of the brands that are easily available to us, we generally reach for Health Valley Organic, which is low in calories, fat, saturated fat, and sodium. Read the labels and choose the best that your grocery store offers! Wow! That’s all a lot of explanation for such a quick and easy soup! We don’t always share so much of the testing, research and nutritional discussions behind each of our recipes. But, we know you THKers care about what goes into the food your family eats. And you want to know that the recipes you choose are fast … and yet also provide healthier options for fueling your family’s busy lives. So we thought you might be curious about some of the ingredients and methods we chose this time around. Oh! One more thing … Are you confused about whether you should use frozen chicken in crock-pot recipes? Yeah – we know … it’s a point of hot debate. Our short answer is: Don’t Do It! (Wanna know why? Check out our recent post Is It Safe to Use Frozen Meat in Your Crock-Pot?). 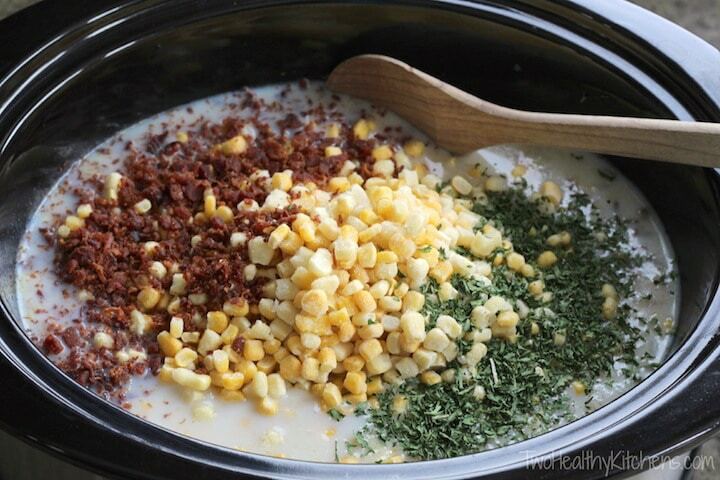 Our families love this corn chowder, and we love how quick and simple it is to make! Stay warm this week, friends! And share those blankets – you don’t need all five for yourself! Combine all ingredients except chicken breasts in your slow cooker, stirring to mix thoroughly and to break up any clumps of vegetables. Add chicken breasts to mixture, pushing them to the bottom of the slow cooker. Cook on low (6-8 hours), or on high (5 hours). Just before serving, use two forks to shred chicken. Or, remove chicken from slow cooker onto a plate or cutting board and cut it into small cubes, and then return chicken to soup in slow cooker. Serve soup sprinkled with cheese or parsley, if desired. 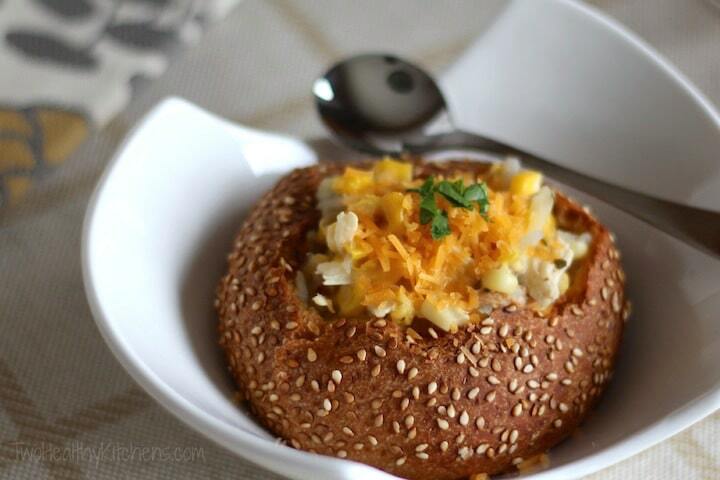 Can be served in hollowed-out, whole-grain dinner rolls as bread bowls. Onions: For this recipe, we prefer to use frozen diced onions for two reasons. Of course, it saves the step of chopping the onions yourself. More importantly, however, the frozen onions break down better and become softer in the slow cooker, especially when cooking this soup quickly on high or for only six hours on low. You can certainly use fresh onion, chopped to equal 2 cups, if you would prefer your onions to be a bit more firm and crunchy in the final soup. Cream of Mushroom Soup: When selecting a cream of mushroom soup, read the labels carefully, as ingredients and nutritional profiles vary widely. We recommend choosing an organic, lower fat brand such as Health Valley. Make-ahead options: You can mix all ingredients except chicken together the night before cooking, then refrigerate overnight. Then just pour the refrigerated mixture into your slow cooker in the morning. We recommend adding the chicken in the morning when you begin cooking. This soup makes a large batch, and refrigerates well to be reheated for additional meals later in the week. It also freezes well after cooking and can be frozen in a tightly sealed baggie or freezer container. « Is It Safe to Use Frozen Meat in Your Crock-Pot? Quick tip for shredding chicken. Put hot boneless chicken breasts in your kitchen aid and use the flat paddle. Turn on and shred a little or a lot! Works like a charm. I make many slow cooker soups but this is the absolute best! Didn’t have hash browns so I used diced potatoes. My husband raved about it. Thank for sharing! This looks wonderful. Can’t wait to try it. Love the idea of frozen onions in slow cooker recipes. Fresh onions seem to be one of the ingredients that take FOREVER to soften in the slow cooker. I’ve found that microwaving them for a couple of minutes before adding them to the crock really helps. Even in South Florida where we don’t get much of a chill its still a great soup. We love it. The only thing I change is I use real onions and real bacon. This will be part of my fall/winter rotation. I made this recipe just today! Loved it!! It’s pretty chilly today and I wanted to make something a little different.. I did substitute the hash browns for real potatoes. I cut them very small but even after the 8hrs they were still on the crunchy side. So be careful if u try to change that part up at all.. Not sure why after all that time they still weren’t done all the way, but lesson learned.. Next time I will stick with the hashbrowns.. Other then that I would make this recipe again and again!! Looking forward to making this chowder, however am allergic to mushrooms can you suggest another cream soup say chicken or celery? Hello ladies, I made this soup for my family last night and everyone loved it!!! We spent all afternoon hovering around the slowcooker cause we couldn’t wait to eat it! It was absolutely delicious and the perfect comfort food! Thank you so much for sharing this easy delicious recipe! we ate it all in just 2 days because we loved it so much! Hehe… I was checking this one out too Ninja 😉 YUM! This was a hit with the whole family and my inaugural London Crock-Pot dish! The kids loved helping me dump the ingredients into the crock pot and then declared it “super-duper tasty”. Paired perfectly with a fresh baguette and butter. I then had the pleasure of enjoying it for lunch the next day – the perfect leftover meal. Thanks for a great wintertime recipe. looks so appetizing and creamy! This chowder looks amazing and totally up my ally of everything I want on a cold snowy day! this looks so good…*sighs*… a must have on a cold winter night! My wife fixed this Creamy Chicken Corn Chowder for dinner last weekend. While I’m more of a meat-here, veggies-there, potatoes-over-there kind of diner, I found this Chowder to be delicious! I’m sure we’ll have this again soon. Thanks, Shelley and Gretchen! Your web site is terrific! What a nice chowder…love the corn and the mushrooms in it…and yes bacon! I feel the EXACT same way about winters in WI! Hence the reason comfort foods and warm-up recipes like this are essential to survival! We have a similar joke in Michigan! At least construction season has sunshine and a some warmth — I’m ready for the snow to melt, please! I’ve also been pleasantly surprised with the cream of mushroom soup options at the store lately! Some foods just demand the soup (sometimes even just for nostalgia) and it’s nice to see options without weirdo ingredients and some are even GF. This looks like comfort food at its finest!!! I love soup, and this looks so creamy and delicious. I really REALLY need to get a crock pot!!! What a great weekend! 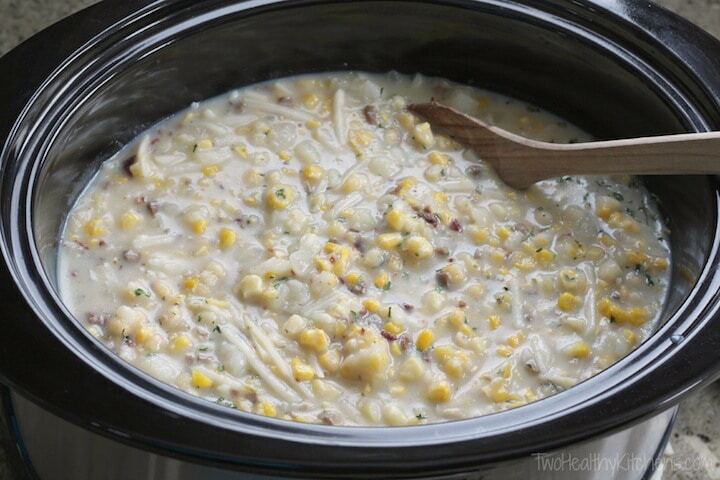 We enjoyed the “Crock-pot Creamy Chicken Corn Chowder”. I love cooking with one pot so clean up is minimal. The bonus here was the great dinner! Thanks so much for this recipe! 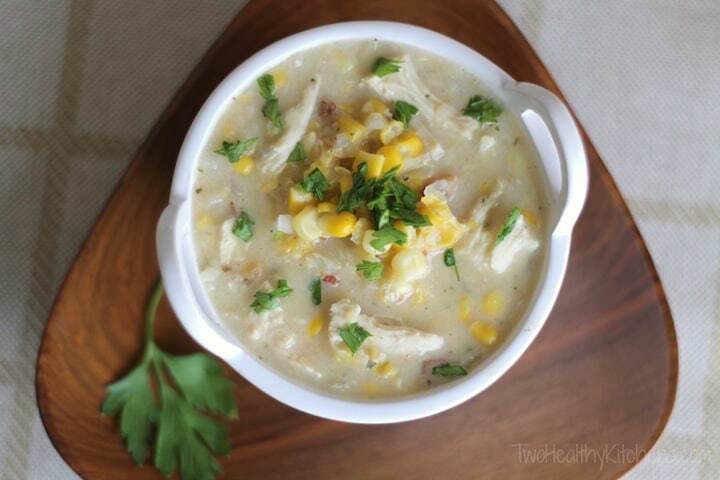 I love chicken corn chowder…especially when it’s healthy and I can throw ‘er in the crockpot! Love this recipe ladies! Question: Did you experiment with the small diced frozen potatoes at some point rather than the shredded? We found that the shredded potatoes disappeared during the cooking process, and we like chunks of potato. Do you think the diced ones wouldn’t cook through well enough? Thanks! Hi, Sue! So glad your family liked it! I normally turn to cheddar or sharp cheddar as the shredded cheese topping to add that last savory layer of flavor as a counterpoint to the sweet corn … but I also LOOOOOVE blue cheese, so your idea to use that as the cheese topping sounds fabulous, too! Oh my gosh – I can totally feel your cold weather pain from here. Yikes! But, you do have to admit, it’s a great excuse for those hearty, belly-warming recipes. 🙂 And, this one sounds fabulous! And, I just recently discovered frozen onions…what a blessing! Sometimes, they are exactly what you need for a recipe. Especially on a busy weeknight!!! I cannot think of anything more comforting than having one of these soups when it is so cold outside. It looks truly comforting and cozy! Yay for chicken soups which include bacon ;–) I believe it is healthy in moderation, so adding it to this soup sounds like a wonderful idea to me. Thanks for sharing the recipe, I think this will be happening soon at home! I like the sound of this, not to mention the simplicity. 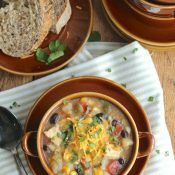 You are right-this recipe doesn’t sound like you-but I love the simplicity and you’ve convinced me to go look for canned soup! And possibly a slow cooker! Making this for dinner! Looks so yummy!!!! 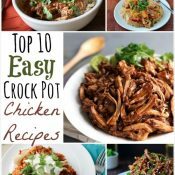 I am loving the crock pot recipes…. Please keep them coming!!!! Thanks so much! Here’s my question though. I only use nitrate/nitrite free bacon in my house? How much of the real stuff would you say I should add? You mentioned that a little goes along way with the quick bacon crumbles so I’m wondering if I’d need more 1/4 cup pan fried to get the same flavor. Lmk! Thx! 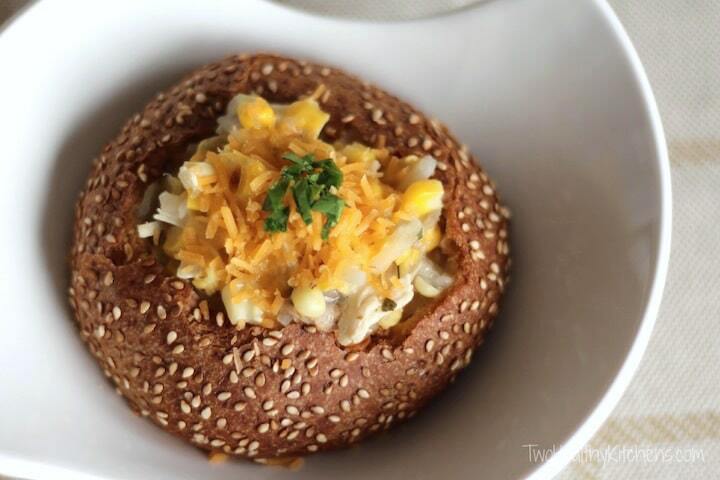 First of all – gorgeous bread bowl shot above! Pretty! This recipe looks perfect. The crockpot and I are BFFs lately, and I love creamy anything soup. 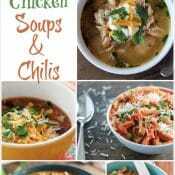 After how popular your crockpot chicken tacos were with us, I’m sure we’ll love this soup as well! There must be a way to make this without a crock pot right? If I just stuff everything in a pan and keep it on low for a while? 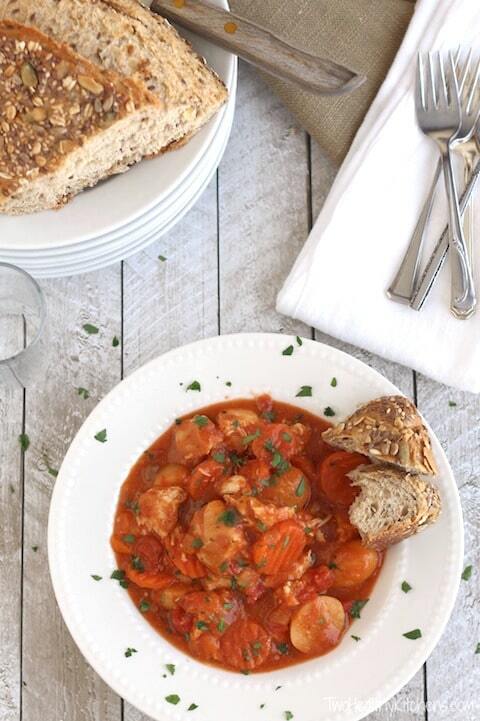 Sounds like it could work… This chowder looks and sounds so delicious! Good question! We actually had a very interesting comment on our 3-Ingredient Crock-Pot Chicken Tacos from a reader in England who was finally able to track down and purchase a slow cooker, but mentioned how much more difficult it is to find them in Britain! Are the Netherlands the same way?!?! It doesn’t surprise me that the slow cooker craze is more of an American thing! Regardless, I think your “stuff everything in a pan” method will work (a large dutch oven would be great for this), but you may need a couple of tweaks. For one thing, because there is very little evaporation in a slow cooker, recipes targeted at that cooking method typically don’t have a lot of liquid, so you’ll probably need to increase the liquid (milk) in this recipe to adapt it to the stovetop. I would just thin it as you go until it’s the consistency you’d like. If you use a lot of additional liquid, though, you may also need to just slightly increase the seasonings to flavor that additional liquid. Easy enough to do – just take a taste toward the end of cook time and adjust the seasonings as needed. Lastly, besides marrying the flavors, the main concern in cooktime for this recipe is to make sure the chicken is fully cooked and tender. If you don’t want to cook the soup for a long time on the stovetop, you could shortcut the process a bit by adding precooked, shredded or chopped chicken breast into the soup toward the end of cooking. But I’m still absolutely loving these easy crockpot meals, and this comfort food one looks amazing! Although he’s a super picky eater, my guy will actually eat corn chowder (not clam, he hates seafood), but… I’m allergic to mushrooms. Is there something else I could substitute? Ladies this looks absolutely delicious and perfect for this crazy cold weather. This is our 2nd straight day of no school due to extreme temperatures. Today windchill..-44 degrees. Yes, that is right it is bitterly cold. Now this Creamy Chicken Corn chowder is just what we need today. Thanks! On my way to the grocery store with all of the ingredients listed for “Crock-pot Creamy Chicken Corn Chowder”. With yummy foods to look forward to, the winter winds can blow and we will be warm!